A little over three months ago I moved into my very own house and what a journey it has been. I knew I would learn some lessons, but what I didn't expect was to learn so much about myself. The biggest lesson of all of them so far would have to be LOVE. 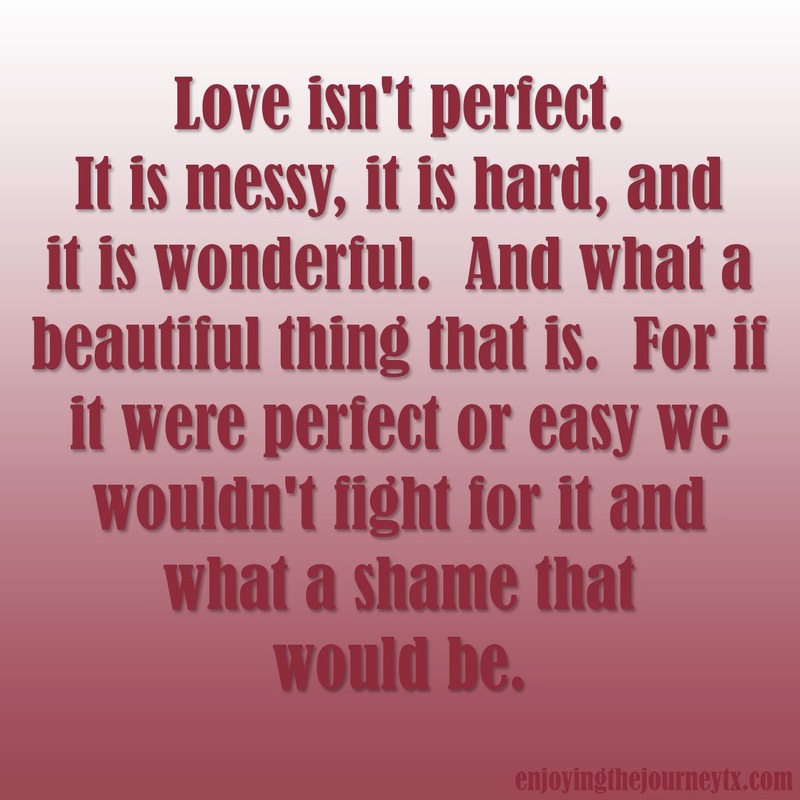 A few words that keep playing over and over in my head are that 'Love is not perfect.' In fact, life is not always perfect. It can come pretty darn close, especially when we are relying and loving on the Lord, but never perfect. Why is this such a big lesson and realization? I think it was something that I needed to realize to quit putting off love and life and to live the life that the Lord has planned out for me. If I wait for all my ducks to be in a row, I can miss on some pretty big stuff and some love. Loving the Lord has always been my biggest priority in life and thankfully my relationship with my Father has grown since I have been on my own. His love has shown me that what I have right now in this moment is from him, and that right there makes it pretty darn great! Fully relying on the Lord for his love has been at the forefront of my mind more in the last six months than I believe it ever has since I have been a believer. And what a precious gift that is! Loving myself is something that can border on dangerous for singles. But now that I am all on my own I had better learn to love myself or I just might go crazy. Self-worth and responsibility come to mind, and yet I don't think I have ever used those two in a sentence together. Loving my parents is such a beautiful thing because since I have moved out and gone next door our relationship overall has not changed that much but it is much healthier. My love for them has grown as I have watched them pour their hearts, time and resources out for me as I decided to go out on my own. I will never be able to repay them, but thankfully the Lord gives me the opportunity to love them. Loving my home looks many different ways. I love my home because well, it is mine. It is such a joy to share it with my friends and family and a joy to have a place of my own. At the end of the day though, I have learned to love it so I will take care of it. Be it pride, be it because I was raised by a southern lady, or my slight OCD cleaning this house is out of love. It is my pride and joy and I thank the Lord for a house to clean and pay bills on. Loving my relationships is something that can also be dangerous for singles. We can tend to put too much love in them, expect perfection, or simply not put enough love in them. The Lord has taught me that those relationships that I love so very much are not perfect. In fact, they are severely flawed. So where does that lead me? That leads me to individually pray for each and everyone of them and to give them to the Lord. It is out of his love for me that he gives me them, and out of my love I will thank him for them in return. To simply put it all, love isn't always perfect. It is messy, it is hard, and it is wonderful. And what a beautiful thing that is. For if it were perfect or easy we wouldn't fight for it and what a shame that would be. So what are you waiting for? Take that next step and love a little! Well said, my friend. Love certainly isn't always easy and I am often reminded of God's love towards me, a wretched sinner. His love is an example for me to teach me how to love others as well. Thank you for this. Thinking of you and sending hugs your way!